— Colson Whitehead, Published in the New York Times on March 2nd, 2008. Relationship to Carroll Gardens: Raised in Carroll Gardens with a brief stint in Amherst, MA for college. Writer you'd like to invite to dinner: Joseph Mitchell for some great, old New York stories. Chef you'd like to prepare the meal: Deb Perelman of Smitten Kitchen fame. Writing soundtrack: Folksy guitar songs, my “Higher Love” Pandora station, or peace and quiet. Coffee or Tea: Coffee to start, tea to stay starting. BookCourt. 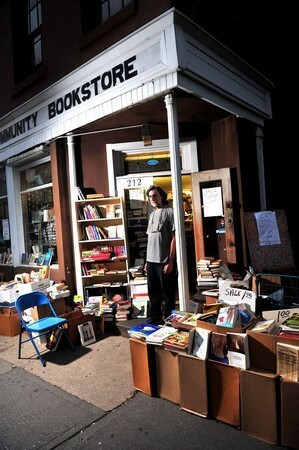 It’s not just an independent bookstore, it’s the literary pulse of Brooklyn. Located on busy Court Street, the Zook Family has been serving the likes of literati since 1981, and you’d be hard-pressed to not find what you’re looking for in their sun-literary shop. (Snag a seat in the back under the sunroof.) No one shows more support for local authors than BookCourt does, and that fervor has turned the store into one of the top event series in the country. Take the wall of titles devoted to staff selections seriously as everyone who works here is a real bookworm. 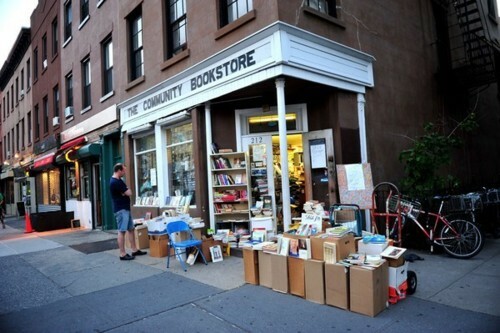 The Community Bookstore. People don’t walk into this dimly lit bookstore… they look both ways before slowly venturing in. Just a couple of blocks down from BookCourt, this independent shop looks like the type of place that might house the portal to another dimension. Owner John Scioli has been the keeper of this beautifully disorganized new and used mess of books since 1985. Once inside, be mindful, for any sudden movement might send a tower of books crashing. John won’t mind though; he’s used to it. Oh, and if you’re too nervous to enter, you’re not alone. 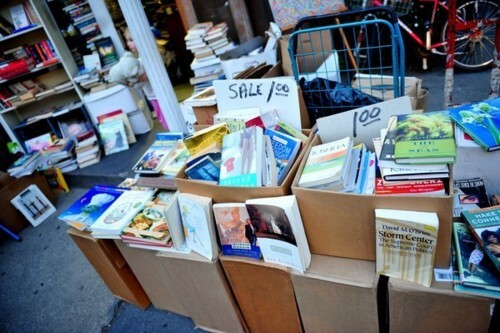 Most people are happy just leafing through his boxes of $1 books right outside the store. The Carroll Gardens Branch of the Brooklyn Public Library. This traditional Carnegie library has been a strong community resource for the neighborhood since 1905. Located on the corner of a tree-lined brownstone block, it’s still a wonderful place to read, write, and study as the sun pours in through big, old windows. Popular with young families, the library also hosts a number of weekly kids events and art programs. The Brooklyn Book Festival. Held at Brooklyn Borough Hall and Plaza every autumn, this renowned book fair is the largest indoor/outdoor free literary event in New York City. Last year’s event drew an estimated 45,000 people to Brooklyn! There’s no better event to rub shoulders with national and international bestselling authors, support your favorite emerging writers, and attend everything from themed readings and panel discussions to author signings and poetry performances. This year, the festival will be held on September 14, 2014, but there will be literary-themed events taking place at bookstores, parks, theaters, and libraries all week. The Brooklyn Writers Space Reading Series. A membership organization that provides quiet office space for over 700 writers, their free public readings are held every month at BookCourt, just down the block from their Court Street location. The series features both published and unpublished authors. BAM: Brooklyn Academy of Music. While BAM is best known for its theater, dance, and film series, they also host a prize medley of readings, lectures, and storytelling events. Sackett Street Reading Series. The Sackett Street Writers' Workshop was born out of eight writers meeting in the kitchen of one woman's Brooklyn brownstone. It is now a creative home for over 2,000 writers. A number of their free reading events are held at BookCourt. Brooklyn Literary Walking Tour. You can hold the historic neighborhood of Brooklyn Heights responsible for placing Brooklyn on the literary map. On the second Sunday of each month, the Greenwich Village Literary Pub Crawl crosses the bridge to offer a walking tour that shows off where some of the most famous writers lived. Find out where W.H. Auden was inspired or where Truman Capote put his pen, and where the likes of Hart Crane, Norman Mailer, Arthur Miller, Henry Miller, Thomas Wolfe, and Richard Wright all lived. It’s a reservation worth making. Jalopy Theater and School of Music. Just kissing the Brooklyn-Battery Tunnel lives a hidden, rustic gem of a red velvet-curtained music venue that, ironically, leaves you feeling very far from Brooklyn. Wearing their love for folk and roots music on their sleeves, owners Geoff and Lynette Wiley have a good thing going on this Carroll Gardens stretch of “road less traveled by.” Go early for some comfort food and brew at their Jalopy Tavern next door or to Phil’s Crummy Corner for some cheap beer and homemade empanadas before plopping down in an old church pew for a toe-tapping, banjo-picking good time. 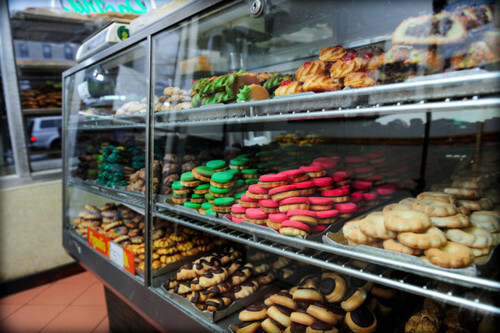 Caputo’s Bake Shop. Skip brunch and do how the locals do. Make Caputo’syour first early morning stop for a cup of coffee ($.95) and a buttered onion roll fresh out of the oven ($.50). Established in 1904 by the Caputo Family, their long, striped yellow and blue bread bags may be the #1 most recognizable logo in Carroll Gardens, and you can be sure that whatever neighborhood restaurant you’re dining at will have sourced their bread from them. I’ll leave you with two words: Lard Bread. 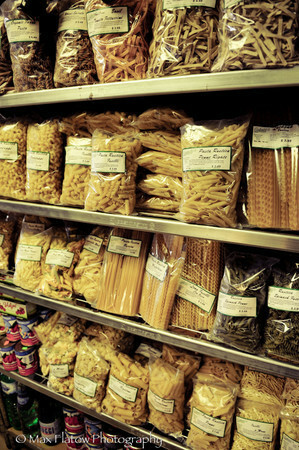 D’Amico Foods. 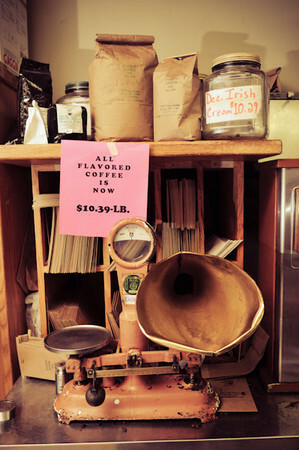 An old Carroll Gardens hangout, this homey 66-year old shop still roasts around 300 to 500 pounds of coffee every day. 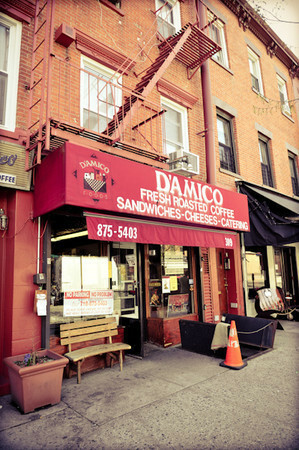 Like Caputo’s, the coffee served at most neighborhood restaurants will have come from D’Amico’s and you wouldn’t even know it. Aside from a serious selection of coffee, they also make a mean Italian hero piled high with deli meat of your choosing (tip: the roast beef is roasted in-house and sells out fast). These days most people ask for their coffees to go; the D’Amicos are slightly nostalgic for the days when customers would stick around. If you go, take your coffee to a table in the back and get to know Joanny, Francis, and Frank D’Amico. They’ll have some good Brooklyn stories for you. Smith Canteen. With its carrara marble café tables and romantic marriage of mirrors, tin, and tile, this corner café is a lovely “Rue de Martyrs”-inspired Parisian respite in a former working-class Italian neighborhood. Offering locally sourced and a seasonally changing array of pastries, sandwiches, soups and salads, Smith Canteen and the Carroll Street Green Market (across the street) hold hands together in pleasant partnership. Grab a tiny table by the window or take a stand at the coffee counter, but don’t leave without pairing your Counter Culture coffee with a homemade fruity pop tart. Lucali. What’s a trip to Carroll Gardens without a quick stop for pizza and calzones? The line for this warm and cozy restaurant may be long, but it’ll be worth the wait once you’re seated and closing your eyes in delight between bites. Served piping hot from the brick oven will come a thin-crust pie in an incredible wash of a grandmother’s secret sauce, painted with toppings of your choosing, a mix of mozzarella cheeses and a final grating of Grana Padano. It’s pizza to write home about. The dimly-lit space is split between just a dozen wood tables and an open marble kitchen counter, so any chair will be a good chair for you to sit and gaze at handsome owner and pizzaiolo, Mark Iacono, as he rolls dough with his customers’ empty BYOB wine bottles. 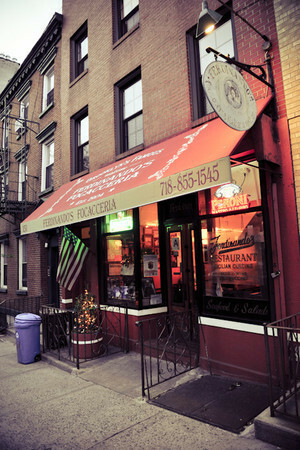 Ferdinando’s Focacceria. 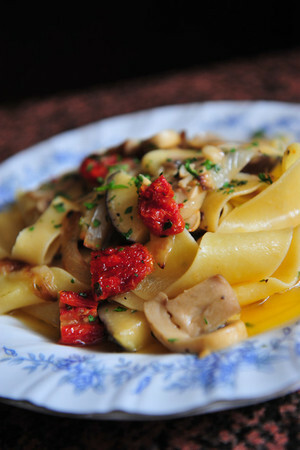 You’ll soon want to add this old-school Sicilian restaurant to your old-world charm bracelet. In the 1950’s, Ferdinando’s was thelunchtime spot for nearby dockworkers with lines out the door for its transcendent panelle sandwich. 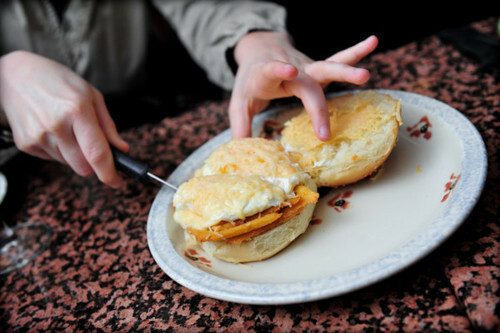 Fluffy fried chickpea fritters dug into a warm house-baked semolina roll with a heap of ricotta and grated cheese. 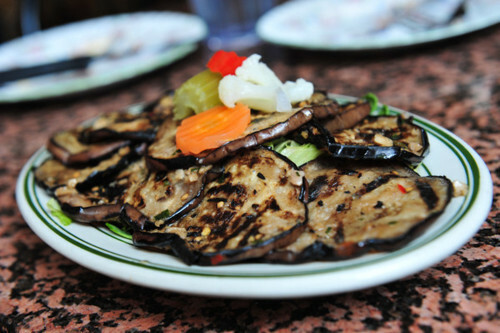 Go and see how many aged folks walk through the door having made the long drive back to the old neighborhood for their favorite childhood food memory. And when they’re done, you know they wash it down with a Manhattan Special, an espresso soda that has been made in Brooklyn since 1895, except Ferdinando’s is the only place left that has it on draft. Go before you can’t go anymore. La Slowteria. Down the south end of Court Street is where you’ll find this super authentic, super relaxed Mexican food spot that goes well beyond tacos and burritos. Hailing from and operating a restaurant in the vacation-friendly beach town of Tulum, chef and owner Hugo Orozco brought his slow-cooked food to Carroll Gardens after meeting and falling in love with a woman who was visiting from New York (now his wife and co-owner). Their corn tortillas are hand-pressed to order; their cocktails and juices are hand-squeezed and one-of-a-kind. Hard to put their menu into words, this is where you go for the traditional recipes fondly remembered, unforgettably deconstructed, thoughtfully re-imagined, and beautifully presented. Guacamole will never taste the same again. Buttermilk Channel. Named after the mile-long tidal strait separating Governor’s Island from Brooklyn, this sweet ‘n salty brunch and dinner spot has been speaking the local language for a few years now. When your menu boasts egg scrambles mixed with hot sausage from the local butcher (Esposito’s) and handmade mozzarella from the local cheese purveyor (Caputo’s Fine Foods), you might as well start counting the number of neighborhood hearts you’ve won over. From the gratis honey and sea salt popovers to the maple and bacon-roasted almond snacks to the oh-so-popular buttermilk fried chicken and cheddar waffles, the portions here carry weight and will have you leaning back in Brooklyn-infused food bliss. Court Pastry Shop. Don’t you dare leave Carroll Gardens without a white box of cookies wrapped in string. Brothers Vincent and Gasper Zerilli have been wiping their flour-dusted hands on aprons since they were kids. 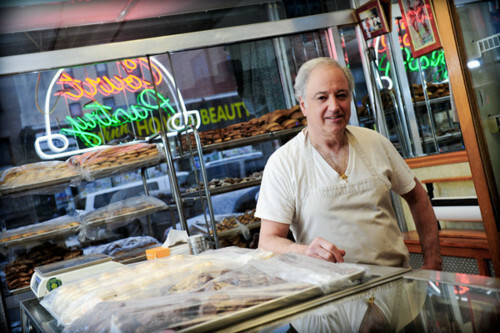 Between their crispy cannolis, cream-filled lobster tails, flaky orangey ricotta-filled sfogliatelles, and old-fashioned Italian cookies, this charming Italian bakery has been putting smiles on faces since 1948, wooing people in off the street with their sweet smells and, oh yes, the best homemade lemon ices around. Forget the wedding cake! My husband and I served platters upon platters of Court Pastry cookies when we got married. Go for the rainbows. Brooklyn Farmacy & Soda Fountain. What was a pharmacy for nearly 100 years is now an adorable, old-timey dessert stop with a paper-hat wait-staff serving old-fashioned egg creams, ice cream sodas, shakes and sundaes from behind a counter lined with old apothecary wood cabinets and drawers. Oozing with charm, it’s hard to know which is sweeter – the hot and cold treats or the vintage Brooklyn, penny candy décor. Margaret Palca Bakes. This utilitarian, unadorned bakeshop is where Margaret, herself, gets the baking done. Steal a peek behind the counter and you’ll see a little, bandana-wearing Margaret in her kitchen folding batter and transferring hot trays of cookies, brownies, pies, and cakes from the oven. Her store is the perfect place to pick up a coffee and a bag of her famous, buttery rugelach before strolling down the Columbia Street waterfront in either direction -- towards Red Hook, or to Brooklyn Bridge Park. Order a simple sandwich made on her homemade focaccia or a container of one of her prepared salads. Either way, no matter what you get, it will have been made with love. By Margaret. 1. Favorite view: The Culver Viaduct. For just a couple short stops between Park Slope and Carroll Gardens, the F and G trains run above ground. Whether approaching or departing the Smith-Ninth Station in Carroll Gardens (the highest subway station in the world! ), I always make a point of putting my phone or book down to take in the industrial landscape of the Gowanus Canal, the Brooklyn skyline, and everyone’s favorite relic of an olden Brooklyn, the heavily instagrammed Kentile Floors sign. 2. Favorite place to write: For hours (hours!) in the window of Ted & Honey. I’ve known this particular “red” corner since I was a kid when it was just thatreally good deli next door to Cobble Hill Park. Now, it’s just that really good café… next door to Cobble Hill Park. When I can’t snag a stool in the window, I make a beeline for one of three seats at the tea and coffee counter. They have a good-looking breakfast/lunch menu that’s locally sourced, and they always manage to have the perfect play-list going at a volume that doesn’t distract. It may be “coffeehouse cool” mixed with a push of the stroller scene, but I don’t mind it one bit. If you find yourself at Ted & Honey in the warmer months, ask for your sandwich to go and then grab a bench next door in Cobble Hill Park. 3. Favorite museum: Of course I'm partial to the Brooklyn Museum of Art. Their temporary exhibits beget animated brunch conversation and their permanent collections of Egyptian, Classical, and Ancient Middle Eastern sculptures, wall reliefs, and dummies can’t be beat. Not to mention every first Saturday of the month (known as “Target First Saturdays”), the museum stays open from 5-11 pm, offering free admission and the chance to move from room to room where you’ll find everything from live music and dancing to films and trunk shows to pop-up curator talks and hands-on interactive workshops. With the restaurant open and the bar serving drinks all evening, it can honestly feel like one huge house party. Target First Saturday was one of the first dates I went on with my husband. 4. Favorite coffee shop: Kings Coffee is co-owned by two Brooklyn brothers, Dominic and John, who brew espresso and sell beans out of their 300 square foot open garage on one of the quietest streets in Carroll Gardens. In warm weather, I love walking up to the bar, with standing room for two, and ordering the Breukelen Dutch – a cold brew coffee made with the country’s first CoffeeGa Ridge, a 3.2L cold drip hand made from bamboo and glass. Drinking coffee at Kings makes me feel really cool and like I’m drinking coffee without anyone in the world knowing. 5. Favorite thing about Carroll Gardens: Even with the scary number of people moving here, it still feels like the same small town I grew up in next to a big city. My boyfriend’s mother, a neighborhood native, lived here for thirty years before fleeing the nest for another part of Brooklyn. When she did return, in 2005, things were a little different. There was a place called “The Grocery” that did not, in fact, sell groceries; Johnnie’s green awning was intact, but his bootery was missing; birthday cupcakes for class parties could no longer be purchased from College Bakery; and where the hell did the Key Food on Court Street go? She had walked two blocks too far that day (past the CVS, which used to be the Key Food) and stumbled into Good Food, a family-operated grocery shop that’s been in business for 75 years. Discount and sale signs taped to the door and windows make it somewhat difficult to see what’s going on inside and perhaps that’s part of the reason why a number of us tend to walk right on by (excluding my boyfriend’s mother, of course). It also happens to be smack dab between two other groceries, Santo’s Farm and Gourmet Fresh. Talk about competition. There was a time, however, when this neighborhood only went to Good Food. Bearing the same name, the store was originally opened by the Bruno families, the uncles of NYC Office of Emergency Management Commissioner Joseph Bruno. Their store was one of the only markets in the neighborhood that had a butcher carving the meat right in front of you, and so for that reason people liked them. (That, and they spoke fluent Italian.) In 1979, after 43 years in business, the uncles sold their store (and the two buildings it takes up) to 24-year old Sale, a dedicated Key Food employee who worked for nine years over on the other side of Hamilton Avenue to help support his family. Key Food customers also shopped at Good Food, and Sale heard of the Brunos’ plan to sell through market chatter. In the 30s, as most of us are aware, Downtown Brooklyn saw the influx of Sicilians, Neapolitans and the Barese coming in by the boatload. After WWII, many were left jobless in their towns, and thousands of them came here to work, to find better work; the Red Hook waterfront was a great place to find it. Older folks that couldn’t drive were able to walk to work; that was the beauty of the neighborhood. In 1970, at 15-years old, Sale immigrated to Carroll Gardens with his mother, father, sister and two brothers. With some difficulty, they were able to rent the top floor of an apartment on 4th Place between Court and Clinton Streets. Sale’s father worked as a longshoreman, and the whole family learned to contribute as best they could. Like many other Italian families in Carroll Gardens, when the money started to come in, it was reason enough to leave for places like Bensonhurst, Staten Island, New Jersey and Long Island - where the houses were detached, and their cars could be parked in driveways. On the evening I’ve come to chat with Sale, the supermarket is a bit busy. It is 6 o’clock on a weeknight and everyone getting off the F train seems to be popping in for this, popping in for that. It’s nice to see. “Come, I take you to my club,” he says, and we walk a few doors down to the Van Westerhout Cittadini Molesi Social Club, where Sale has been president for the last 11 years. An interior that, for years, I have tried to steal glimpses of without looking too curious although I don’t think it hurts to be so. In fact, I think you’ll find that the older Italians appreciate curiosity. I also think this is why Sale invites me in, even though I am a woman, and women are not permitted inside. He likes that I want to know about things. As soon as we sit down, Sale offers me some wine, some Italian soda, espresso, anything I’d like. 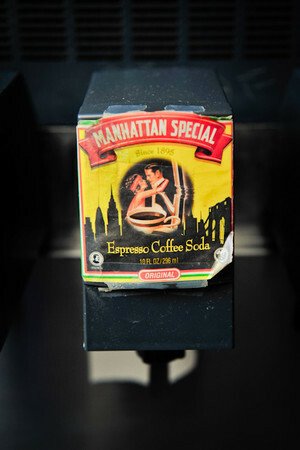 Espresso, I say, and someone else gets up to make it for me. Two men are playing Briscola, a trick-taking game that’s played with a deck of Italian cards. I see sports trophies, Italian memorabilia, flags, framed news and lots of old pictures. “I don’t know if you noticed, but we changed the name on the street,” Sale says, referring to Court Street and 4th Place. “It’s called ‘Citizens of Mola di Bari Way.’” He turns around to point to the street sign that hangs on the back wall. “Who comes in here?” I ask. There’s an argumentative question that gets floated around both sides of the playing field these days, and that question is: Who’s more unfriendly? The old-timers or the newcomers? I’m of the mind that people are people, everyone is different, and that we need to stop generalizing these groups as if a correct answer actually exists. There will always be someone nicer and there will always be someone nastier. Sale looks at me if he’s never been told that before in his life. Young families dominate Carroll Gardens today, but these families are nowhere near the size of what a family in the 50s, 60s and 70s used to look like. Parents had 5,6,7,8 kids, and your cousins lived next door, and your mother lived downstairs and her brother lived up the block. You couldn’t just bring home a pound of pasta and a couple packages of chicken breast for dinner. You did a serious grocery shop and filled your freezer until you could barely close it. You did that, and you bought bread…lots of bread. Today, Good Food still offers these family-sized grocery plans, and I have to wonder: Who’s buying them? The cheapest plan starts at $44.95 and for that you get: 2 chickens, 1 ½ lbs. chicken cutlets, 1 ½ lbs. pork chop, 1 ½ lbs. beef stew and 2 lbs. of chop meat. The most expensive plan costs $89.95 and that gets you: 3 lbs. eye round roast beef, 2 lbs. chicken cutlets, 1 ½ lbs boneless pork chops, 2 lbs. homemade sausage (sweet or hot), 3 lbs. pork roast, 2 lbs beef stew and 1 ½ lbs. spare ribs. Holy Mola di Bari, that’s what I call “dinner”! Today in the store, Sale is in charge of groceries while his brother manages the meat, and their sister works the register. Unfortunately, none of Sale’s three grown sons want to take over the store. “I feel bad that a 75-year old store might have to go to strangers,” Sale says, his mind on retirement. I can only hope that in thirty years, like my boyfriend’s mother, if I were to ever leave the neighborhood and come back again, that Good Food will be exactly where I remember it being. Go stop in before it’s too late. Family Plan #4 should last you all winter. 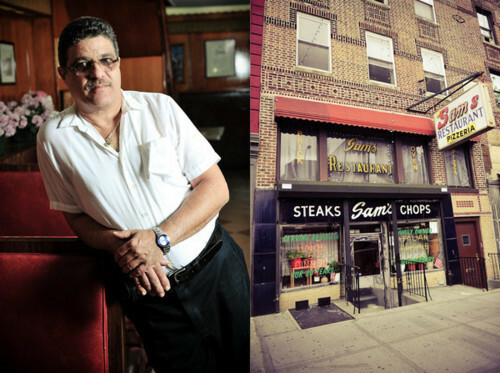 After more than fifty years of servicing the neighborhood, Joe’s is officially no longer. The deep fryer has been turned off. The last of the cold cuts have been sliced. Sodas, potato chips and canned goods have been given away to the deli next door, as well as to any stunned and nervous customer who found their way in to say goodbye, their heads in a fog because what will life look like (or taste like?) now without those little rice balls? 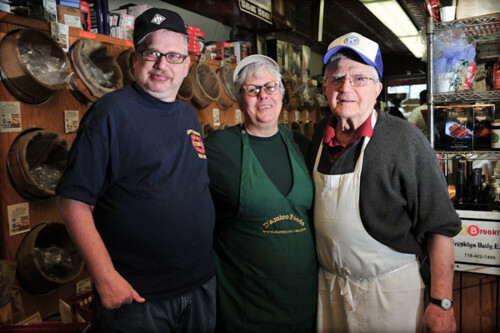 Due to a worsening condition of bone cancer, Leo Coladonato, the beloved owner who bought the deli from Joe in 1985, hadn’t been in the store since the last week of February. His right-hand man, Louie, had been working nonstop on his behalf to keep the business up and running. But it got to be too much. Some may think the shop's closing had something to do with the spat between chef Mark Iacono and neighborhood guy Benny Geritano last month, but Louie says that couldn't be further from the truth. For now, Louie’s plan is to go back to painting houses, storefronts and the like. 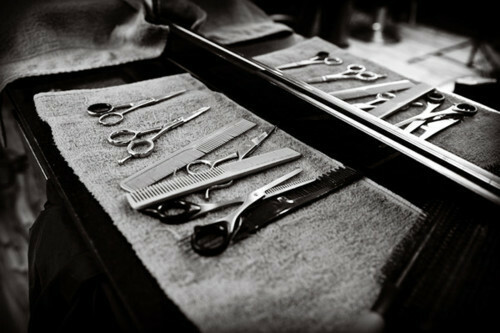 Working at Joe’s for over twenty years, he’s looking forward to taking some time for himself. Local blog Pardon Me For Asking first reported Joe's closing. 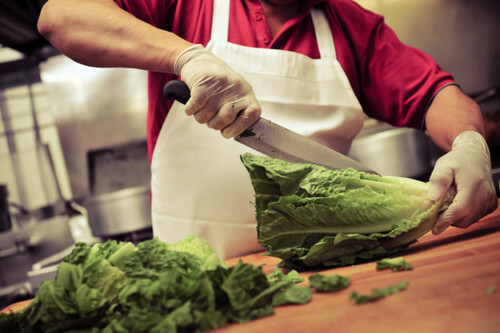 Well, when you’ve got customers lining up for both sandwiches and rice balls, and you’re the only one manning the counter and the deep fryer, it’s no wonder Louie would feel the strain. 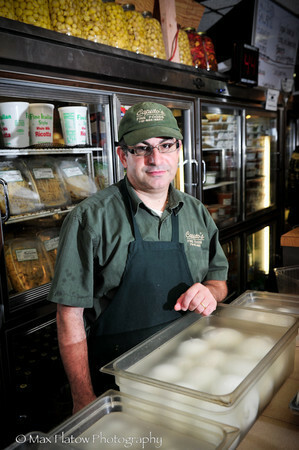 Long-time Carroll Gardens resident and “friend of the store,” John Verderama, was happy to take some rice ball batter off of Louie’s hands. Yesterday, John and his wife spent the afternoon rolling two hundred balls with plans of freezing them (and keeping them frozen for as long as they can stand the temptation). “How’d they come out?” I ask. “Not too good, I bet,” Louie jokes from behind the counter. Truth be told, no one but Louie and Leo will ever be able to replicate the store’s infamous rice ball miniatures. The recipe, which was inspired by the fried calzones that Leo’s mother used to make, will be taken to the grave. A “reincarnated” Joe’s S_perette would make Henry Weingartner, a 3rd grader at P.S. 58, very happy. 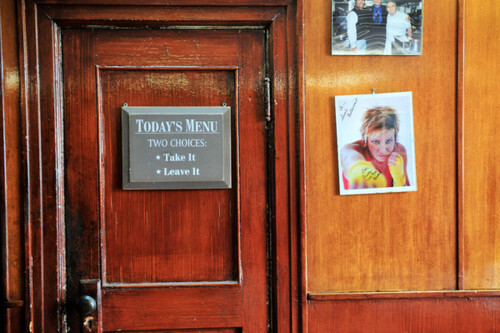 Henry’s father, Eric Weingartner, says that it was “places like Joe’s” that sold him on the neighborhood when he moved his family from the city to Carroll Gardens seven years ago. Yes, nothing is sadder than watching another old door turn its lock. But local photographer and Carroll Gardens native, and this writer's brother, Max Flatow, 26, is trying to look on the bright side. However you choose to look at it, Joe’s S_perette will surely go down in history as one of the most prized stores the neighborhood has ever known. We are missing them, but Joe’s will (always) be missing U.